Figure 4-16. 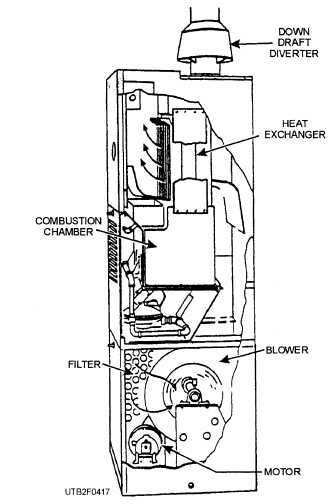 - Cutaway view of a horizontal stowaway oil furnace. Figure 4-17. - Gas-fired vertical warm-air furnace. that part of the furnace where it joins the main trunk duct (fig. 4-18). The blower control starts the fan or blower when the temperature of the heated air rises to a set value and turns the fan or blower off when the temperature drops to a predetermined point. Thus the blower only circulates air of the proper temperature. A knowledge of air distribution principles is important when dealing with central warm-air heating systems. Satisfactory heating from warm-air systems is absolutely dependent upon proper distribution of warm air from the heat source to all portions of the space served. Warm air must be distributed in quantities that are required to offset the rate of heat released to each room. With radiator systems, distribution is primarily a problem of getting enough hot water or steam to each radiator to be sure the radiator heats to its rated capacity. It is not possible to deliver more heat through steam or hot water than the radiator is designed to transmit. With warm-air systems, however, the rate of air delivery and the temperature of the air delivered to the room determine the amount of heat reaching each room. Temperature balance, therefore, is primarily a problem of controlling air distribution. Factors, such as velocity, volume, temperature, and airflow direction, play an important part in temperature balance. In addition and for human comfort, space-temperature variations and noise levels must also be considered. Convection currents result from the natural tendency of warm air to rise and cold air to fall. Examples are the temperature variations near doors and windows, and when dense, cool air is drawn away quicker than warm air. Objectionable noise will result at supply diffusers if room velocities exceed 25 to 35 feet per minute (fpm). Air stratification and cold floors may also result when supply diffusers are not properly located within the space.